Cambridge, Mass. 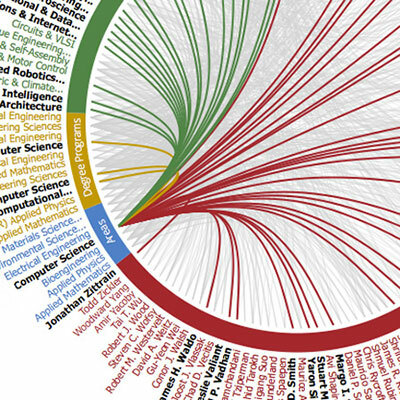 – July 24, 2014 – A new online visualization tool designed to help users see the myriad connections between faculty, academic programs, and research and teaching areas has been deployed on the Harvard School of Engineering and Applied Sciences (SEAS) website. A defining characteristic of SEAS is the interconnectedness of teaching and research areas. The very structure of the school—it is organized around broad and overlapping areas, but has no traditional departments—underscores the interdisciplinary philosophy at SEAS. For example, graduate students or prospective industry collaborators can use the online tool to quickly identify SEAS faculty members who conduct research in a particular field. Individuals interested in one of the School’s degree programs can see how it corresponds to research areas and the faculty who teach in that program. The tool was created by Rebecca Mazur, SEAS web developer. It was her capstone project as a student in CS 171, the course on visualization taught by Hanspeter Pfister, An Wang Professor of Computer Science. To access the tool across the SEAS website, click the red box marked "Explore SEAS Connections"